Foot care important to have a sound body. Our feet bears our body weight which is not an easy task. They contain some important nerves which help in the proper functioning of the body. Feet is that part of the body which it doesn’t get proper rest and care, will not let your body function properly. Our feet after going through so much of unrest and improper care faces a lot of problems. So it is better to start using different remedies of foot care at home. Prevention is better than cure is the best example in this case. If you don’t start doing your foot care on time, then it will lead to the following problems. Athletic feet (fungal infection in between toes). Bunions (bump developed on the large toe joint). Heel spur (an outgrowth of calcium between the heel bone and arch of foot). Feet is as important as our face because it bears the whole body weight, and goes through a lot of unrest. There are a different set of home remedies for foot care which you can follow to get the best results. You can get beautiful and clean feet by just following these small set of tips at home. One and the important thing that you should keep in mind is to wash your feet daily. Keep your feet clean. Wash your feet in the lukewarm water. Soak your feet in the warm water for 20 minutes. Follow the process twice a day to have better results. Use antifungal or antibacterial soap for washing of feet. After the washing of your feet, the next step to have beautiful feet. It is easy to scrub your feet after washing. Your feet become soft. Scrub your feet gently. It helps in removing the dead skin cells which will prevent the occurrence of calluses and corns. 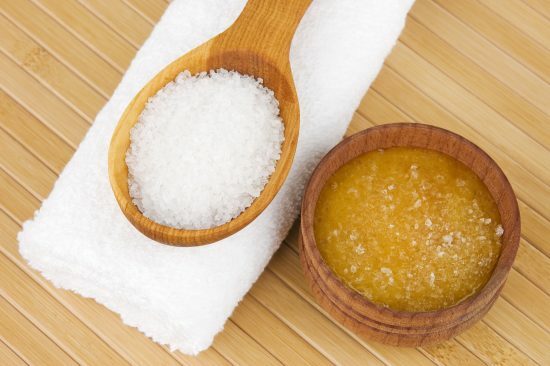 You can use a homemade scrub by using sugar with any oil. The next step after washing and scrubbing of feet is to moisturize the feet. Moisturizers help your skin to stay nourished and beautiful. You can use the olive oil, coconut oil or cocoa butter to moisturize your skin. Moisturizers help you in retaining the beautiful skin. Apply moisturizer to your feet daily before going to sleep. Put on your socks to retain the moisturizer. Trim your toenails carefully. Use good quality nail clippers or nail cutter. Avoid using scissors or blades for trimming your toenails. Cut your toenails properly by not cutting them deep which will lead to discomfort. Assure to trim your toenails from time to time. Check the ingrown toenails that create severe pain. Wear the shoes those fits well to your feet. Too tight shoes create discomfort and are sometimes the major reason behind ingrown toenails. Exercise and go for a walk daily to keep your feet skin cells active. Walking has a number of health benefits. Foot care is one of them. Prevent your feet from being in too much contact with water. Too much contact with water can cause different disorders related to feet and can cause major damage to your feet. Consider your feet as important as your face. Our feet need the same care. We give very less attention towards the foot care. It feels shameful to have cracked heels. Its high time, start caring about your feet. Follow these homemade tips of foot care to have beautiful feet.